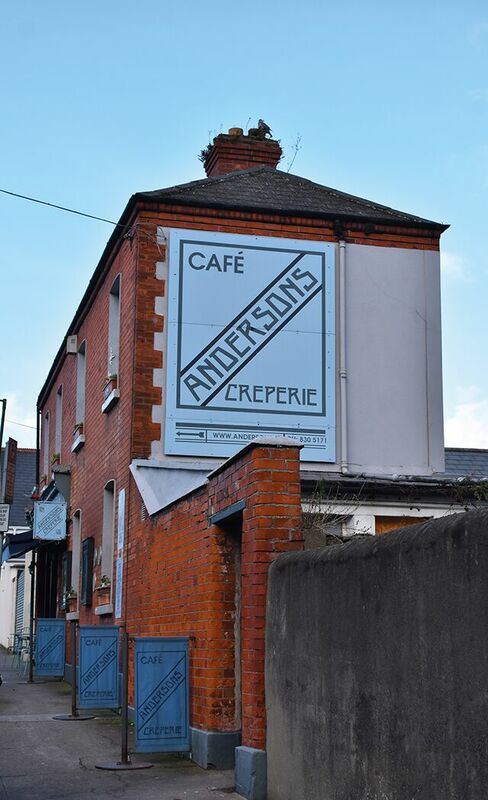 Tucked down a side road just off the main road in Drumcondra, lies the quaint little creperie that is Andersons. Stood alone on the back street surrounded by red brick houses, the breakfast and lunch bar seats four outside under a small canopy. On entering the establishment, one is greeted immediately by an array of cakes and bakes in a beautifully lit, curved glass counter to start the mouth watering, before being seated by one of the helpful, friendly staff. Andersons Creperie in Drumcondra opened in 2006, three years after the original Andersons Food Hall & Cafe first opened in Glasnevin, and has been serving traditional crepes and galettes ever since. The cafe has been a regular stop for those that find themselves hungry for good food on the northside. The stylish, French bistro-esque interior is dotted with wine bottles on every available shelving space, showing off a well found respect for the restaurants French origin. The subtle lighting lent a delicate hand to the gentle ambience. An open view of the kitchen gives a sort of self confidence to their food, there’s no hiding behind a door and customers can observe as their food is cooked and prepared and crepes are smoothed with precision over the traditional french billig crepe makers and flipped with skilled rigour. Anderson’s offers a selection of galettes, crepes, toasts and omelettes on their breakfast menu. Plenty to choose from and plenty for vegetarians, picky eaters and non-meat eaters, so there will be no problem getting a bit of grub. The All Day Breakfast Galette is basically a full Irish covered in emmental cheese and wrapped up nicely in a perfectly cooked and slightly crispy crepe, topped with a lovely runny egg and served with a side of fried baby potatoes and tomato chutney. Enough for any classic fry lover to branch out into the world of hybrid international cooking, a mix of classic french and classic Irish. For veggies the alternative to the above is the All Day Vegetarian Galette. A delicately crisp crepe filled generously with grilled peppers, tomato, baby spinach leaves and mushrooms all smothered with a heavenly helping of gubbeen cheese and topped with an egg. For those with a sweet tooth, they’ve got it covered with a crepe filled with combinations that will get anyone salivating, like roasted pears, pecan nuts, mascarpone, salted caramel and fresh cream or roasted peaches, meringue pieces, white chocolate, fruity coulis and vanilla ice cream. The quintessentially continental option to have wine with a lunch meal is also there with a wide selection of wines from across the world. The menu is so vast with delectable choices it makes it difficult to choose, but it’s certain that one will not be disappointed with whatever ends up on the plate that lands on the table. The pricing is very reasonable it’s well worth every penny for very decent food and an enjoyable chat. Averaging at about €10 per meal, it’s easy to get a lot more for less money than in other similar places. Whether its a quick coffee or a proper bite to eat, it’s impossible to be dissatisfied. Andersons is a fantastic joint and should be bumped to the top of any foodies list of places to visit for fine food in Dublin. Great staff, incredible food and the open plan environment clears the tables and opens it as a nice place to create free flowing conversation and a few laughs.